Since 2007, Watershed has honored skilled ceramic artists with distinguished careers during Legends events around the country. These events were originally held in conjunction with SOFA in Chicago and featured a gala dinner and award ceremony. Today, Watershed shines a spotlight on the work of the Legends via talks, presentations and exhibitions that bring awareness to the work and contributions of these artistic pioneers. The following biographies and supplemental information provide context and material to better understand the Legends’ work and histories. Val Cushing (1931-2013) was born in Rochester, New York. He received his BFA in 1952 from the School of Art & Design in the New York State College of Ceramics at Alfred University. After serving two years in the Army, during the Korean War, he returned to Alfred and received his MFA in 1956. His full-time teaching career began that year at the University of Illinois in Champaign-Urbana. 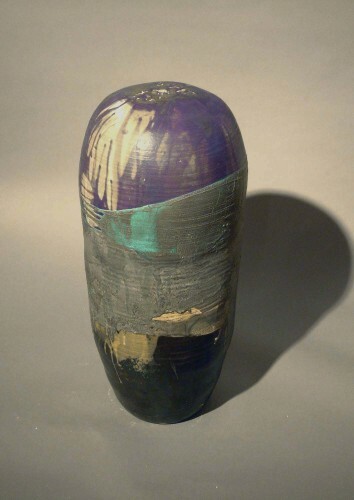 The following year, 1957, he returned to Alfred where he taught pottery and technical courses concerning clays, glazes and related subjects for 41 years, retiring in 1997 as Professor Emeritus. 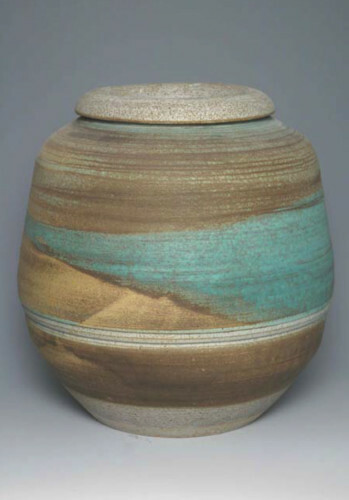 Val’s pottery is recognized internationally and has received many awards and honors, and is represented in the collections of many public and private museums and galleries in the USA – including the Smithsonian, the Brooklyn Museum of Art, Cooper-Hewitt, and the Everson. His honors include recognition from Alfred University, from New York State and from NCECA for his role as a teacher. He is a Fellow of the American Craft Council and of NCECA where he was a founding member and a past president, and is a recipient of grants from the National Endowment of the Arts, Fulbright, Archie Bray Foundation and the University of Wolverhampton, England. William Daley (b. 1925) began his art career on the G.I. Bill after World War II, earning a B.S. degree at the Massachusetts College of Art and an M.A. degree at Columbia University. Daley has consistently demonstrated that his thin-walled vessels in concave and convex shapes can be made into architectonic objects. He hand-builds all objects and leaves them unglazed so as not to diminish their angles and lines. Surface areas are burnished to offer tonal variations in the clay. 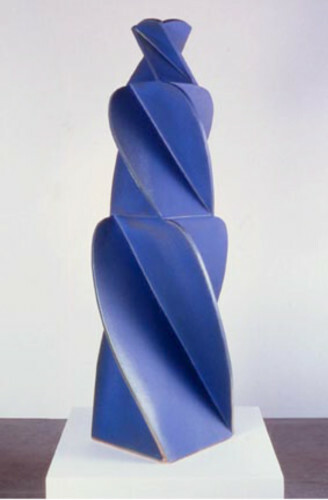 From 1957 to 1990, Daley was a professor of ceramics and industrial design at the University of the Arts in Philadelphia. He is represented by Helen W. Drutt English. Ruth Duckworth (1919-2009) began her training and career as an artist in England after fleeing Nazism in her home country Germany. She first attended Liverpool School of Art (1936-1940), and later continued her education at the Central School of Arts & Crafts, London, where she also taught from 1959-1964. Ruth came to the US to teach at the University of Chicago in 1964 and remained in the states since. Like her life experience, Ruth’s work ranges from major mural installations to intimately scaled pieces. In her pieces one remembers clay’s origin in the actual stuff of earth and the ever-present feel of her fingers and hands molding and shaping and kneading and forming. Select major collections include the Art Institute of Chicago, Boston Museum of Fine Arts, Windsor Castle, England, Stuttgart Museum, Germany, and the National Museum of Modern Art, Japan. Among Ruth’s many awards and honors are an Honorary Doctorate from DePaul University, Chicago, in 1982, and the American Craft Council Gold Medal, in 1997. Karen Karnes (1925-2016) successfully embraced innovation and tradition, merging utility and sculpture to forge a body of work of remarkable depth and beauty, and was widely admired for her artistry, independence, and mentorship of younger colleagues. Starting at Alfred University in 1952 she moved on to a teaching residency at Black Mountain College in North Carolina where her career crossed paths with experimental artists of that time including John Cage, Merce Cunningham, Peter Voulkos, and Robert Turner. She then set up her studio in Stony Point, NY, later moving to northern Vermont. For thirty years, as the artistic director of the annual Old Church Pottery Sale in Demarest, NJ, she became both a mentor to younger artists and a leader in the field of contemporary studio pottery, creating a vigorous dialogue among artists in the field. She is represented by Leslie Ferrin Gallery. John Mason (b. 1927) is closely allied with Peter Voulkos, and the pioneering Otis Clay group. While studying painting at Chouinard Art Institute, the Nevada native dropped in on one of Voulkos’ ceramics demonstrations. During the nineteen fifties and sixties, both artists pushed the boundaries of functional ceramics to the outer limits to create massive, energetic sculpture that broke the ceramic field wide open. Mason’s huge, rough pots, walls, monumental rectangles, x shapes and crosses are a testament to the enormous vitality and artistry that he pours into his work. His vigor remains undiminished and is coalesced into new works that curve and spin through space. John is represented by Frank Lloyd Gallery in Santa Monica. Jim Melchert (b. 1930) has been a fixture of the Bay Area’s artisitci center for the better part of 50 years. Jim graduated from Princeton with a major in art history. After graduating he spent four years teaching English at the Tohoku Gakuin schools in Sendai, Japan, returning to the States in 1956 to earn an MFA degree in painting at the University of Chicago. It was in Chicago where he first encountered Peter Voulkos’ work in an exhibition, an experience he would later deal with by enrolling in Voulkos’ summer courses in Montana. 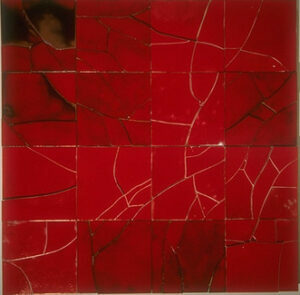 In 1958 he moved to Berkeley where Voulkos was establishing a ceramics studio at the University of California. Since, Jim held a faculty appointment at University of California Berkeley from 19656-1992, and was Director of the Visual Arts Program at the National Endowment for the Arts from 1977-1981. Among his many awards are honorary degrees from the Maryland institute College of Art and the San Francisco Art Institute. Don Reitz (1929-2014) began his career at Alfred University where he received his M.F.A and subsequently taught before beginning his 26 year tenure University of Wisconsin, Madison. Don was a virtuoso who maintained a fine balance between technical mastery and improvisation with surfaces that are complex, dense and aggressive. A skilled technician, a natural teacher and a fearless improviser, he served as mentor to thousands of ceramic artists. Don is represented in numerous museum collections including the Smithsonian Institute, the Art Institute of Chicago, the Boston Museum of Fine Arts, the American Craft Museum and the American Museum of Ceramic Art. 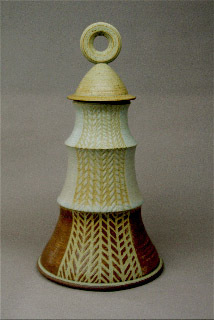 In 2002 he received one of the highest honors in the field when the American Craft Council awarded him their Gold Medal. 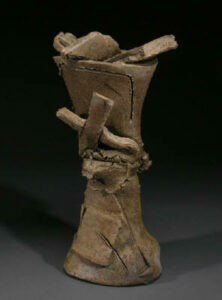 In the world of contemporary ceramics, Richard Shaw (b. 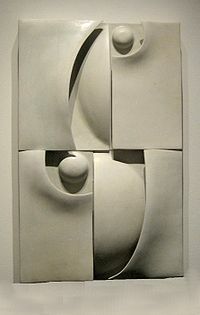 1941) is the master of trompe-l’oeil sculpture. He has developed an astonishing array of techniques, including perfectly cast porcelain objects and overglaze transfer decals. By combining the commonplace with the whimsical, the humorous with the mundane, Shaw captures the poetic and the surreal with the sensibility of a comedian. Richard is one of the most respected and collected artists in contemporary ceramics. Son of an artist mother and cartoonist father, he came up in the San Francisco Bay Area art scene attending San Francisco Art Institute and the University of California Davis in the fertile period of the 1960s. He continues to add to his skills and appropriate from mass culture. 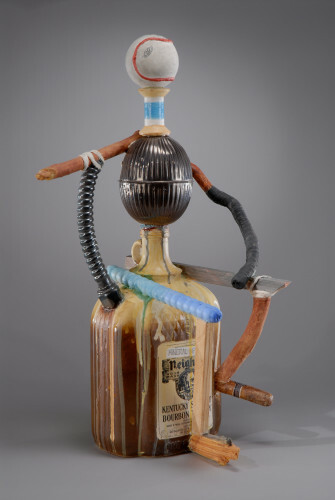 He has developed a vocabulary of found objects that form intimate still life sculptures, complex figures, and personally referential assemblages. He brings life to the detritus of the studio, as a cartoonist animates the page. Over his career, Richard has created a distinguished body of work, and has been recognized through grants from the National Endowment for the Arts and included in major public and private collections across the country and internationally. Paul J. Smith (b. 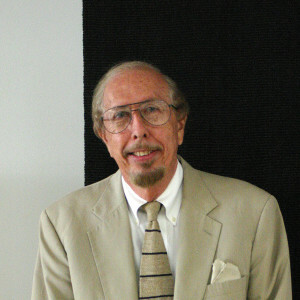 1931), Director Emeritus of the American Craft Museum (now Museum of Art & Design) has been involved with the craft and design field since the mid 1950s. He joined the staff of the American Craft Museum in 1957, and was appointed Director in 1963. In September 1987, after 30 years with the Council, he assumed the position of Director Emeritus to develop an independent consulting service to the field. Widely recognized for his ambitious and innovative exhibition programs, Paul’s curatorial experience includes such ground braking exhibitions as Objects USA, 1969; In Praise of Hands – Toronto, 1974; Craft, Art & Religion, the first craft exhibition at the Vatican, Rome, 1978; as well as numerous exhibitions at the Museum – Designed for Production: The Craftsmen’s Approach; The Teapot; The Door; For the Body among many others. His book, “Masters of Craft”, includes his photographs of over 200 notable studio artists and craftspeople of the 20th century. Paul’s service to the field includes participation on numerous boards and committees – e.g., Haystack Mountain School of Crafts, Penland School of Crafts, the World Craft Foundation, Louis Comfort Tiffany Foundation and the Lenore G. Tawney Foundation. Born in Hawaii of Japanese descent, Toshiko Takaezu (1922-2011) worked in clay for over 50 years. 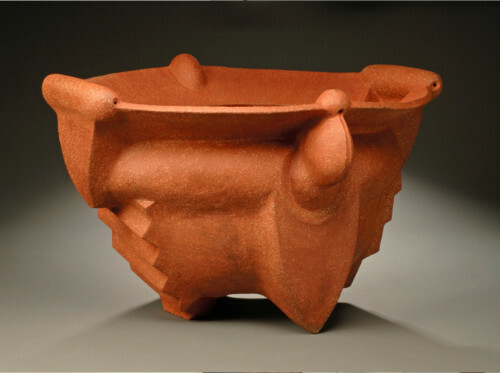 Her work developed steadily throughout her career as she moved from producing functional vessels to abstract sculptural forms. Takaezu’s spontaneous approach to glazing, in which she walked around the vessel freely applying glaze through pouring and painting, balanced her more methodical building process and allowed her to add an improvisational element to her work. Her academic career included teaching at Princeton from 1967-1992, where she retired to continue her studio practice at her New Jersey home and studio in Quakertown. 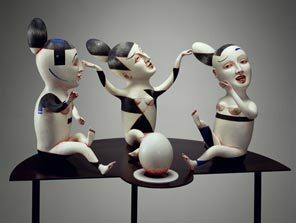 Her work is held in many prestigious collections including The Metropolitan Museum of Art, The ASU Ceramic Research Center, and the Boston Museum of Fine Art. Patti Warashina was born in Spokane, Washington, in 1940. She earned her BFA and MFA from the University of Washington, where she later went on to teach for 25 years; she is now Professor Emeritus. Patti has a long and respected resume in the arts. She is a Fellow in the American Craft Council, she has received the Artist Trust Twining Humber Lifetime Achievement Award, the University of Washington Distinguished Alumnus Award, the Governor’s Award of Special Commendation for the Arts and twice won grants from the National Endowment for the Arts. Patti’s work is included in the collections of The Smithsonian/Renwick Museum, Washington, DC; Museum of Art and Design, NYC; John Kohler Art Center, Sheboygan, WI; Mint Museum, Charlotte, NC; L.A County Art Museum; Arizona State University Art Museum, Tempe, AZ; Racine Art Museum, WI; Detroit, Seattle, Tacoma and Portland Art Museums; University of Washington, as well as international museums such as the National Museum of Modern Art, Kyoto; Australia’s Perth Cultural Center; and Korea’s Icheon World Ceramic Center.